WASHINGTON (CNS) -- When he was running for re-election in 1992, President George H.W. Bush told Catholic News Service that he believed that a strong religious faith could provide "an extra shot of strength when you need it." Catholic leaders, including the U.S. Conference of Catholic Bishops, joined in "grieving the loss of one of our nation's leaders." "We remember with gratitude this great man who spent his life selflessly in service of his country," the president of the U.S. Conference of Catholic Bishops said Dec. 3. "With an unwavering commitment to building bridges of peace and ensuring our nation's freedoms, he also inspired many as a devoted husband, father and family patriarch." "On behalf of my brother bishops of the United States, we pray for the repose of the soul of our 41st president as we remember a life well lived," said Cardinal Daniel N. DiNardo, who heads the Archdiocese of Galveston-Houston. "We also offer our deepest sympathy and prayers for his bereaved family and all those who mourn his passing. May you find peace and comfort in the consoling love of Jesus Christ." 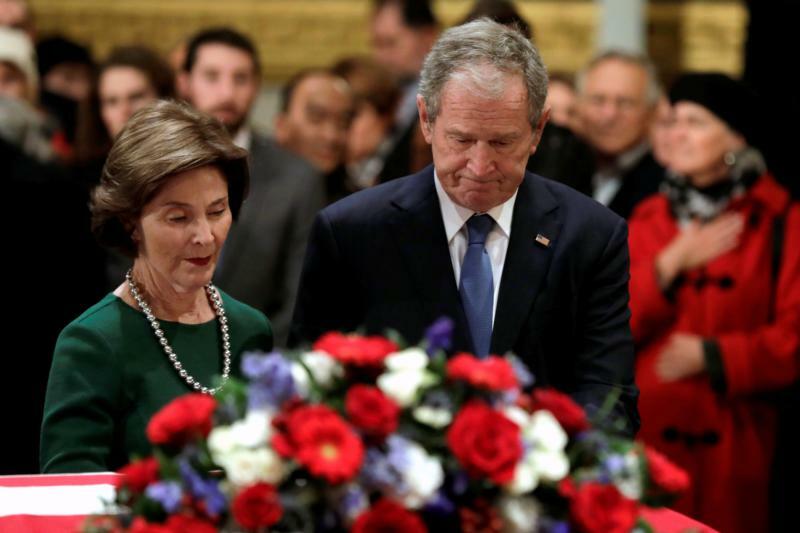 "Notre Dame joins with our nation and world in mourning the passing of President Bush," said Holy Cross Father John I. Jenkins, president of the Catholic university in South Bend, Indiana. "He was the epitome of a public servant, not just in the Oval Office, but in his eight years as vice president, his many years as a congressman, ambassador and CIA director, and in his service in the U.S. Navy during World War II." Holy Cross Father Edward A. Malloy was Notre Dame's president from 1987 to 2005 and presented the honorary degree to Bush during commencement ceremonies that year. He also worked on two of the president's major initiatives -- his Drug Advisory Council and his Points of Light Foundation. "I found him to be a leader deeply committed to the country he had been elected to serve, a gracious host and a down-to-earth person," Father Malloy said in a statement. "He recognized the importance of American higher education and he sought to enhance it. He also sought to promote a culture of citizen engagement with the great issues of the day." Attending the funeral of the pope in 2005, then-former President Bush recalled for reporters how the pontiff had opposed the war, which ended Feb. 28, 1991, citing what he called the pope's "standard position on the use of force" and his concerns about "the long length of the war." One news account said Bush "lamented the fact that he (himself) never engaged in a discussion about the concept of a 'just war.'" During his pontificate, St. John Paul met with Bush twice at the Vatican, first when Bush was vice president and then when he was president. Born in Milton, Massachusetts, June 12, 1924, Bush delayed entrance to Yale University to volunteer for service in World War II. At 18. he was one of the Navy's youngest pilots. After several flying successful bombing missions, he was shot down during one in 1944 and was rescued at sea. The rest of his flight crew perished. Carol Zimmermann contributed to this story.